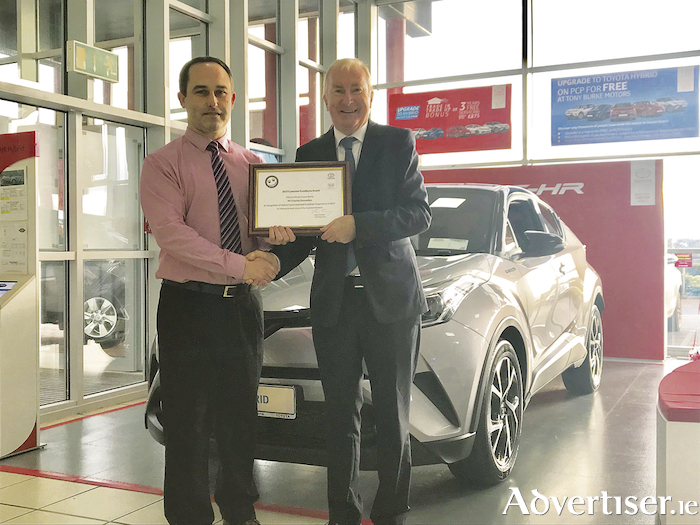 Charlie Donnellan (left), Toyota sales manager at Tony Burke Motors, Ballybrit, won the 2017 Customer Excellence Award from Toyota Ireland in recognition of delivering exceptional customer service in 2017. He is pictured with Tony Burke, managing director of Tony Burke Motors. Mercedes-Benz Vans plans to offer all its commercial van model ranges with electric drive option over the next few years. This will start with the mid-size eVito in the second half of 2018. The eVito will be followed in 2019 by the eSprinter, and a further model will follow. The leading van manufacturer presented its holistic electric drive strategy at the [email protected] workshop in Berlin. The focus was not just on the electric van itself, but also on a technological ecosystem tailored specifically to customers’ business needs. A holistic strategy based on five cornerstones delivers an innovative total-system solution covering the entire value chain of commercial usage. The new eVito is the first production vehicle to have been developed using this strategic approach. Volker Mornhinweg, head of Mercedes-Benz Vans, says the company is convinced by the necessity of electric drive in its vans, especially in city centre applications. "That said, electrification of the commercial fleet is not an end in itself, but follows the same principles as a classic drive when it comes to commercial feasibility. With our [email protected] initiative, we’re showing that only holistic mobility solutions extending beyond the drive itself present a real alternative for commercial customers. The eVito is the starting point and will be followed by our new-generation Sprinter as well as the Citan,” he says. With an installed battery capacity of 41.4 kWh, the range of the new eVito will be around 150 kilometres. Even in unfavourable conditions, such as low outside temperatures and with a full load, it will have a range of 100 kilometres. The mid-size van is thus perfectly configured for city centre use by delivery companies, tradespeople and public transport providers. The battery can be fully charged in around six hours, while an output of 84kW and up to 300NM of torque deliver dynamic performance. When it comes to top speed, the customer can choose between two options: A maximum speed of 80km/h fulfils all requirements in city traffic and urban areas, while conserving energy and increasing range. If more speed is needed, the customer can choose a top speed of up to 120km/h. The electric model demonstrates its suitability for everyday use, not least with a generous load space. It can accommodate a maximum payload of 1,073kgs and a maximum load volume of 6.6m3. Installation of the battery beneath the vehicle contributes to the unrestricted usability of the entire load space. The maximum gross vehicle weight stands at 3,200kgs.